Ken Auletta is on KQED Forum right now, talking about his new Google book, and I just heard him comment on Google’s vulnerability to new competitors by hauling out the old complaint that Google’s provision of millions of results means it’s doing a poor job of serving it’s users. We hear this one all the time — and it gets Google’s value precisely wrong. When Google came along in the late ’90s we already had search engines, like AltaVista, that provided millions of results. Google is the antidote to the millions-of-results problem. All of Google’s value — and the reason that Google originally rose to prominence — was that it solved this problem, and got columnists like me to rave about its value while it was still a tiny startup company. Let’s do that “real William Shakespeare” search. Right now I actually get 15 million results. Who cares? Nobody ever looks past the first, or at most the second or third, page of results. And Google’s first page of results on this query is not bad at all. Many of the top links are amateur-created content, but most of them provide useful secondary links. As a starting point for Web research it’s a pretty good tool. If you fine-tune your query to “Shakespeare authorship debate” you do even better. Yes, it’s true that the Google search box is less useful with generalized product and commercial searches (like “London hotels”), where the results are laden with ads and fought over by companies armed with SEO tactics. Google has all sorts of flaws. But it’s time to bury the old “millions” complaints. They’re meaningless. And Auletta’s willingness to trot them out doesn’t give me much hope for the value of his new book. 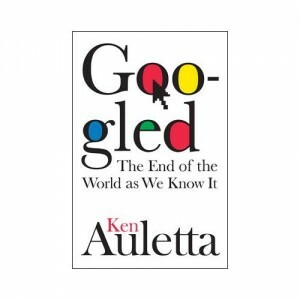 I heard Auletta on Fresh Air the other week and I thought both he and Terry Gross were truly off base in understanding Google, search and the general landscape of the web. Auletta wrote some wonderful books about old media in his day, and I think he’s still largely trapped in that view of the world. Scott, how about investigating why all the popular search engines ignore punctuation, making it virtually impossible to search for source code (like “#include “) or document numbers (like “DCID 6/3”)? I find Google nearly totally useless for searching – I have always preferred AltaVista; however neither is capable at all of searching using punctuation. Since when did that become an irrelevant part of expressing ideas in written words? Seems awfully presumptuous to me. Is it laziness on the part of the implementers of search engines, or is there something more basic that I’m missing? HA just found a curious side-effect of your blog software – my example for searching for a C include file originally included something that looks like an HTML tag (left angle bracket, beer.h, right angle bracket) and the software seems to have ingested that rather than displaying it. Aren’t programmers smart? And a perfect example of how making incorrect assumptions about the value of punctuation elucidates my point.